Diagnosis: Head with erect ‘bristly’ vestiture, eyes without hair, labial palpi with stiff lateral bristles, palpi not recurved, maxillary palpi often visible and folded, five segmented; fw with Rs4 running to costa, f/hw with media stem present in discal cell, hind tibiae with 'bristly' vestiture. Diversity: World wide there are 15 subfamilies, 320 genera, and more than 3,000 known species; at least 49 genera and 112 species in North America; five species, two subfamilies, known from North Dakota. Checklist numbers: 261-326, 387- 434. Biology: Adults may lay up to 200 eggs, some species lariparus (giving birth to up to 60 first instar larvae). Larvae often build portable cases, a few species construct tubes or webbing. Larvae fill a wide variety of niches: scavengers, lichenophiles, algivores, or detritivores. Exotic niches: boring in antelope horns, aged carnivore dung, and algae growing in sloth fur. 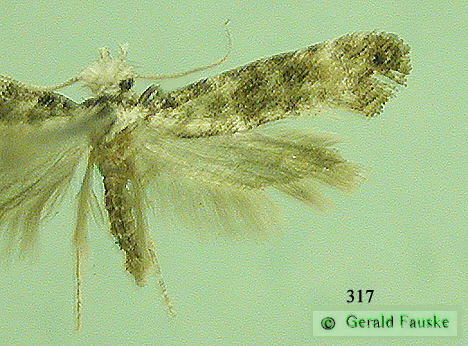 Some species of economic importance: Cloths moth, Case-making cloths moth, and Carpet moth. Davis, Donald R. and Gaden S. Robinson, Chapter 7. The Tineoidea and Gracillarioidea in Kristensen, Neils P. ed. 1999. Lepidoptera, moths and butterflies. Part 35, Vol. 1 in Handbook of Zoology. Maximilian Fischer ed. Walter de Gryter, New York. 491 pp. Forbes, William T. M. 1923. Tineinae, pp. 122- 140, in Lepidoptera of New York and neighboring states. Part I. Primitive forms, Microlepidoptera, Pyraloids, Bombyces. Cornell Agric. Exp. Sta. Mem. 68: 729 pp. Scoble, Malcom J. 1992. Chapter 11. Lower Ditrysia, pp. 225- 254 in The Lepidoptera: form, function, and diversity. Oxford Univ. press. 1982. 404 pp.